The following eleven step IMS Retrofit Pre- Qualification procedure was developed by Jake Raby at Flat 6 Innovations. During the initial development of the IMS Retrofit Procedure and components, some items of concern were noted from the very beginning. Over the years, these procedures have been updated to address these, thus increasing the effectiveness of the IMS Retrofit procedure. This procedure has been employed at Flat 6 Innovations since the very first IMS Retrofit was performed. To date it has resulted in a 100% success rate for the Flat 6 Innovations Preventative Service program. Having performed the very first IMS Retrofit and after performing more IMS Retrofits than any other facility, a perfect record has been maintained by Flat 6 Innovations by employing these procedures verbatim. Today, roughly 20% of all engines that are inspected will fail this pre- qualification, and will require repairs to be made prior to the IMS Retrofit being performed. The biggest mistake that can be made is assuming that every vehicle is healthy enough to have the IMS Retrofit performed. 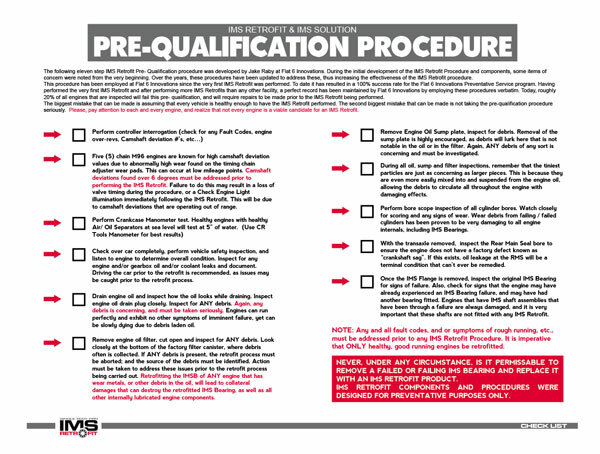 The second biggest mistake that can be made is not taking the pre-qualification procedure seriously. Please, pay attention to each and every engine, and realize that not every engine is a viable candidate for an IMS Retrofit.